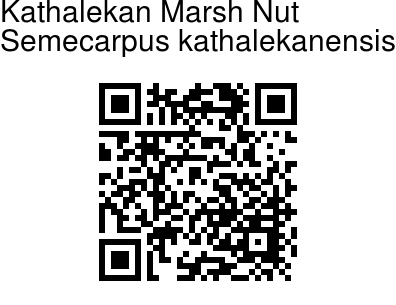 Kathalekan Marsh Nut is a newly described (in the year 2000), critically endangered, evergreen tree, up to 20 m tall. Bark is smooth, greyish brown, mottled with numerous prominent warts, blaze light brown. Branchlets are stout, smooth, hairless. Latex is acrid, watery, turning black on exposure. Leaves are simple, alternately, spirally arranged, carried on stalks 5-10 cm long. Leaves are 45-100 cm long, 15-22 cm wide, largely oblong-lanceshaped or obovate, tip obtusely and abruptly long-pointed, base wedge-shaped and oblique, margin entire and wavy. Secondary nerves are about 20 pairs. Flowers are borne in panicles in leaf axils, unisexual greenish. 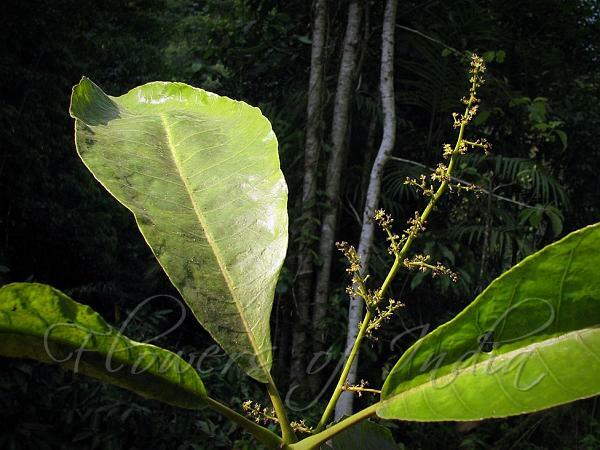 Male inflorescence is 30-50 cm long, female inflorescence 5-15 cm long, minutely rusty velvety. Fruit is compressed, obliquely kidney-shaped, about 2 cm, 1-seeded. Kathalekan Marsh Nut is endemic to to the marshes of Western Ghats.